The demand within the global market for juice concentrate has been rising on account of the growth of the beverages industry. Several new products have been added to the portfolio of the beverages sector, and this is a key consideration while gauging market growth. The presence of juice concentrate in multiple beverages as well as foods has played an integral role in market growth. The past decade has been an era of advertising genius in food marketing which has in turn propelled demand within the global market for juice concentrate. Juice concentrate is manufactured via several processes including crushing and powdering of vegetables and fruits. The final products obtained via this process is subjected to other natural reactions which gives the juice concentrate The global market for juice concentrate is projected to expand at a rapid pace as new food and beverages products pervade the markets. 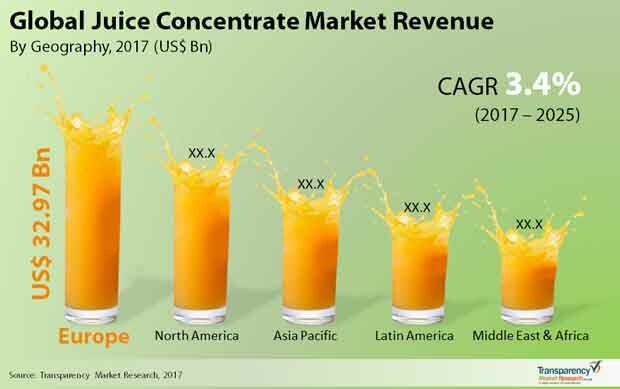 The global market for juice concentrate is projected to grow at a steady CAGR of 3.4% over the period between 2017 and 2025. Furthermore, the cumulative value of the global juice concentrate market was US$89.56 bn in 2016, and is expected to touch a value of US$117.89 bn by 2025. The demand dynamics of the global juice concentrate market are expected to improve as new food processing technologies emerge in the industry. Transparency Market Research (TMR) published a report on the global juice concentrate market that gives a clear view of the force and trends that have aided market growth. The reports segregates the various parameters on which the juice concentrate market has been segmented. Furthermore, the report also gives a peek into the geographical dynamics of the global juice concentrate market. The global market for juice concentrate can be segmented on the basis of application. The key application segments for the juice concentrate market are beverages, sauces and soups, bakery products, dairy products, and confectionery. The demand for juice concentrate in the beverages sector has been increasing at a rapid pace in recent times. Based on distribution channel, the global market for juice concentrate is segmented into online distribution channels and offline distribution channels. Offline distribution channels are further segmented into supermarkets and hypermarkets, and departmental stores. The two types of juice concentrates are vegetable juice concentrate and fruit juice concentrate. On the basis of form, clear concentrate, powdered concentrate, and frozen concentrate are the key segments. On the basis of geography, the global market for juice concentrate is segmented into Asia Pacific, North America, Latin America, Europe, and the Middle East and Africa. The matured food and beverages industry in the US and Canada has impelled demand within the juice concentrate market in North America. Furthermore, the market for juice concentrate in Asia Pacific has also expanded at a stellar rate as international products glut the Indian and Chinese markets. Some of the key players in the global juice concentrate market are Ingredion Incorporated, Diana Food, SkyPeople Fruit Juice Inc., AGRANA Group, and Sunopta Inc.